Yildirim Holding AS is seeking buyers for its stake in the world’s third-biggest container shipper as the family-owned Turkish company presses ahead with a plan to acquire Ports America Holdings Inc., a U.S. maritime-terminal operator. 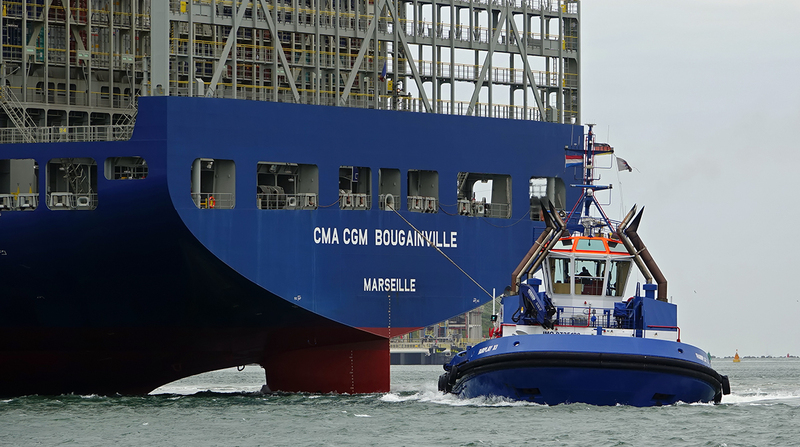 Yildirim mandated China Citic Bank Corp. to find investors from Asia or the Persian Gulf for its 24% interest in CMA CGM SA, Chairman Yuksel Yildirim said in an interview in Istanbul on July 3. Investment banks have valued the holding, which Yildirim bought for $600 million over a period spanning 2010 and 2011, at $2.5 billion to $3 billion based on recent deals in the industry, he said. “We will either exit our investment completely or remain as an ordinary shareholder,” Yildirim said. A plan to sell the stake in the French company back to its majority owners failed in 2015, he said. Yildirim is seeking a financial investor to join a bid by its Yilport Holding AS unit for Ports America as part of a plan to be among the 10 biggest container-terminal operators in the world by 2025, the chairman said. Ports America, the largest independent maritime terminal operator on the U.S. Atlantic and Gulf Coasts with 42 locations, is owned by Oaktree Capital Group’s private-equity unit, Highstar Capital. Yilport, which has $1.7 billion including bank loans and equity to finance its share of the acquisition, is facing difficulties in finding a financial partner for the New Jersey-based operator, Yildirim said. Yilport operates 26 maritime terminals in Turkey, Portugal, Ecuador, Sweden and Malta, among others. “Alliances and consolidations in the container-shipping industry in the past year have widened the difference between what buyers expect and what sellers are ready to pay,” reducing returns for financial investors, he said. Yilport has an exclusivity agreement signed in April with Oaktree that will expire at the end of July, and aims to complete the acquisition by the end of this year, Yildirim said. Yildirim said he will also hold talks soon with six strategic investor groups in China to sell half of its stake in a $5 billion project to develop a coal mine, build a railway link and a port in Colombia after his Best Coal Co., a unit of Yilmaden Holding AS, bought the assets from CCX Carvao da Colombia SA in 2014. A series of talks with private-equity firms, including companies from the U.S., Europe and China, to sell a minority stake at Yilport failed after potential investors adapted a “wait-and-see” policy toward Turkey because of political uncertainty in the country, Yildirim said. JPMorgan Chase & Co., which managed the process of negotiations, is still mandated if a “new window of opportunity opens up,” he said. Yildirim Holding aims to achieve $2.2 billion of sales this year from $1.6 billion a year ago, while its earnings before interest, tax, depreciation and amortization, or EBITDA, is expected to rise to $719 million from $465 million in 2016, Yildirim said. Yilport’s revenue is forecast to reach $650 million with EBITDA rising to $208 million this year from $560 million and $140 million, last year, he said.